Fantastic home on the shore of Lake Tahoe, step off your back deck onto sandy beach! Property Size 2,057 sq. ft.
New on the vacation rental market, owner keeps the lake front home in fantastic shape. Walk off the lake side deck onto the sandy beach! Downstairs has kitchen, dining room, living room and den area, along with a full bath. Upstairs has three bedrooms and two baths, one bedroom is a master with deck overlooking the lake. 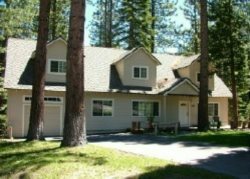 The home is in the gated Tahoe Meadows area, a nice private, quiet spot with lots of open space and natural areas. Tahoe Meadows is an oasis in town, a private gated area, but still very close to the casino area and gondola. During the summer, there is a full time recreation supervisor who will be available free of charge to provide activities such as hiking, biking, kayaking, etc for kids of all ages during your stay at this home.